How to Validate and Submit Form Using VueJs and PHP? I'll also mention that many modern browsers have client-side validation built-in by using HTML attributes such as (but not limited to) required and maxlength="10". However, not all browsers support this and all of them behave differently. Let’s look at how to build our own form validation using Vue.js so it behaves the same in all modern browsers. All inputs are required. 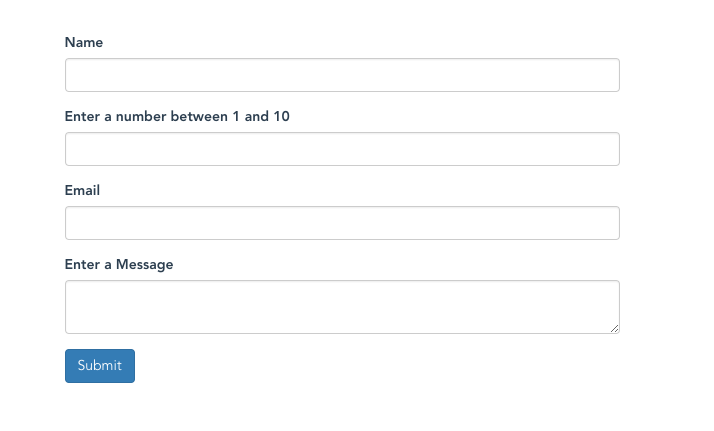 The number input should only allow numbers between 1 and 10 & email input should have a valid format. Start with a basic HTML file with the Bootstrap 3 stylesheet and Vue.js. Our form will go in the content area. Just to get a prettier layout, we’ll put it inside a single col, inside a single row, inside a single container. Each of these elements have classes that position them nicely. 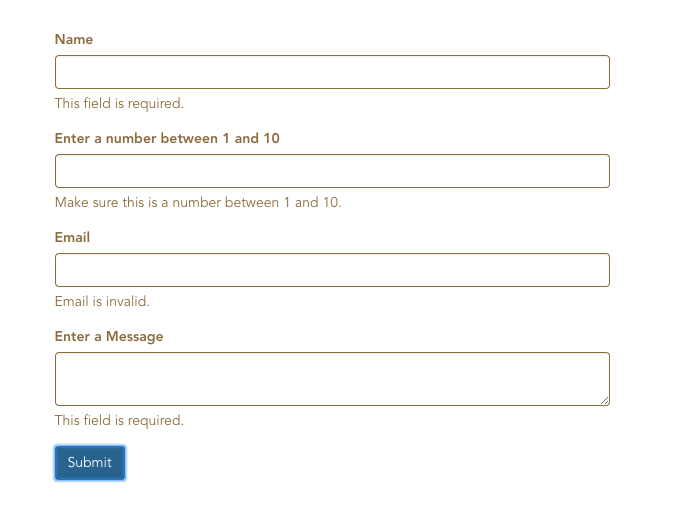 Now, our 4 input elements and submit button will go inside the form. Bootstrap provides validation classes. Let’s add those as well. Right now, the feedback elements will always be displayed. Later, we'll make sure they’re only shown if validation fails. With the HTML in place, now we'll jump into main.js and start coding the logic for our form. 5. attemptSubmit — A boolean that indicates whether the user has attempted to submit the form. We can use this to hide validation warnings until after the user has tried to submit the form. 6. postStatus - A boolean that indicates whether the form has been submitted. We can use this to hide the form after the submission. wrongNumber is a little more complex, but not bad at all. Return true if the value is not a number or it’s less than 1 or it’s greater than 10. missingEmail return true if the value has not a valid format or null. If you try to submit with an empty fields, a warning appears. The nice part is that, the way we’ve coded it, when the user corrects their mistake, the warning goes away immediately. After the validation is successful, we will submit using PHP. In order to submit the POST values we are going to use. Axios. Axios is a promise-based HTTP client that works both in the browser and in a node.js environment. It basically provides a single API for dealing with XMLHttpRequests and node’s http interface. A frequently overlooked but very useful capability Axios provides is the ability to create a base instance that allows you to share a common base URL and configuration across all calls to the instance. Create a folder 'php' and create a file 'post.php' under it. This is because these are the only content types that must be supported by user agents. So the server and PHP traditionally don't expect to receive any other content type (which doesn't mean they couldn't). But if you are working with Ajax a lot, this probably also includes exchanging more complex data with types (string, int, bool) and structures (arrays, objects), so in most cases JSON is the best choice. The content would now be 'application/json' (or at least none of the above mentioned), so PHP's $_POST-wrapper doesn't know how to handle that (yet). The data is still there, you just can't access it through the wrapper. So you need to fetch it yourself in raw format with file_get_contents('php://input') (as long as it's not multipart/form-data-encoded). After the form is submitted, you will see confirmation message as below. I have created a component called 'Form.Vue' with above pieces. Here is the complete source code. Thank you for this tutorial, worked like a charm! How to Upgrade to PHP 7 or 7.1 on macOS?